More than 2,000 pounds of illegal shark fins were seized from a San Francisco business owner involved in challenging a shark fin ban late last month, prompting the group to drop its suit, officials said today. Michael Kwong, 42, of San Francisco was found to be selling shark fins during a Jan. 29 inspection of his business, Kwong Yip, Inc., located at 1220 Howard St., according to Lt. Patrick Foy of the California Department of Fish and Wildlife. Officers seized 2,138 pounds of suspected shark fin from Kwong, Foy said. 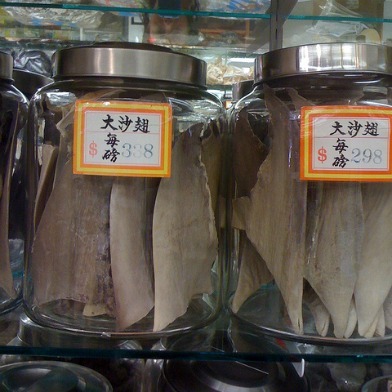 Kwong was cited under a new state law banning the sale of shark fin that took full effect on July 1 of last year. According to the Humane Society of the United States, he was also part of a coalition challenging the constitutionality of the law in federal court. Jennifer Fearing, California senior state director for the humane society, said that Kwong was part of the Asian American Rights Committee of California, a group that sued to block the law on the grounds that it was discriminatory against Asian-Americans. The group also argued that the ban on shark fin was superseded by federal law, but the National Marine Fisheries Services upheld the law in a ruling last week, according to Fearing. Fearing said that in response to the allegations against Kwong, the group has dropped the lawsuit. However, she noted that a second lawsuit filed by a separate group of shark fin merchants is still pending in federal court. A hearing on motions to dismiss that case are scheduled to be heard on March 19, Fearing said.